Enter your text here...Yamaha’s acclaimed body pickup faithfully captures the rich resonance of the instrument’s entire body, as well as vibrato and other performance nuances. A second newly developed bridge pickup directly captures string vibration. * The SV255 is shown in the photo. Yamaha’s acclaimed body pickup faithfully captures the rich resonance of the instrument’s entire body, as well as vibrato and other performance nuances. A second newly developed bridge pickup directly captures string vibration so that attack and bowing subtleties are accurately reproduced as well. A pickup blend control allows optimum balance between pickups. The dedicated control box offers easily accessible volume and two-band tone control, clipped to the player’s belt or to another convenient location. It also features a headphone monitor output with independent volume control. In addition to a line out jack that’s suitable for sending the SILENT Violin™ signal to an amplifier or effect unit, a balanced XLR type output is provided for direct, high-quality connection to professional sound reinforcement and recording equipment. 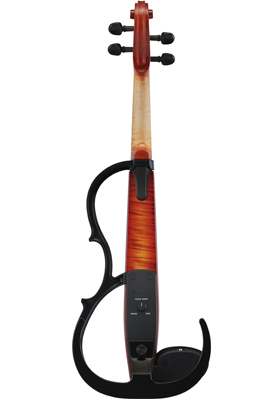 The “Acoustic Hollow Body Design” so highly regarded in the SVC110 Silent Cello and SLB200 Silent Bass has been adapted and optimized for refined violin sound and playability in the SV250 and SV255. The result is a deep resonance that is remarkably close to acoustic violins in quality, as well as a familiar, intimate playing feel. An exquisite shaded finish brings out the beauty of the natural wood grain. At 500 and 540 grams, respectively, the 4-string SV250 and 5-string SV255 are about the same weight as many of their acoustic counterparts. Furthermore, the tailpiece, neck, and tuning pegs on both models are exactly the same as those used on acoustic violins. Precision construction and meticulous attention to every detail mean total satisfaction for the most discerning player. Most standard shoulder rests can be used.